Children spend far too much time in front of computer screens and games consoles. It’s been in all the papers, so it must be true. But what is a lesser-documented fact, is that there are also millions of kids who are happy to kick technology into touch and get active – while the former group is being encouraged constantly to try their hand at one sport variant or another. Opportunities to get excited about particular sports and events are being offered direct to schools. Last year’s Rugby League World Cup for example – which was won by current Four Nation’s favourites, Australia - created an educational package for teachers to get rugby into the classroom, for example. Organisations like Sport England are committed to encouraging young people into sport from an early age and hooking them into community clubs when they leave school. And, of course, we are still benefiting from the legacy of The London 2012 Olympics which inspired so many young people to try something new. Player’s pick – You may have been quite the lacrosse champion during your school days, but don’t impose your sporting bias on your children. Watch sport together and notice what peaks their interest. Give lots of sports a try and make sure that, above all else, your child is having fun. Drop the ball – football, rugby and cricket may be obvious and popular choices, but bounce around some other ideas too. What about martial arts, horse riding, gymnastics or golf? Keep it in the family – your child will be learning new skills and it’s helpful and fun to practise them at home. Play catch, dribble a ball around some cones or critique cartwheels in the garden. Improving their technique will heighten their sense of achievement and motivate them to continue taking part. Don’t go for gold – If your child displays a particular talent, then of course you should encourage and support them to reach their potential. But most kids just want to have fun. Make sure that happens by choosing a high energy coach that concentrates less on technique and more on involvement and activity. Late developers – don’t give up on sport. Some kids just aren’t ready until they’re a bit older. Former Welsh rugby player and commentator Jonathan Davies didn’t take up the sport until he was 19. Play by the rules – turning up on time, with the proper kit and with the right attitude is a good life lesson for children. Taking part in sport teaches self-discipline and personal responsibility especially when you and your child are sacrificing time and, perhaps, other interests or activities. 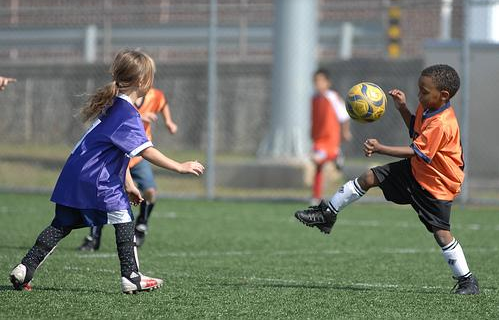 How do you encourage your children to be active?